Cardi B and her wardrobe choices are inching closer to letting the cat out of the bag about her pregnancy. She showed up for her "Invasion of Privacy" album release party Thursday night in NYC rocking a very open jacket, albeit a loose fitting one -- and, in the process, gave photogs the first glimpse of her baby bump. Cardi's still opting to SAY nothing about the baby B she and Offset are expecting ... so, maybe she's just gonna let pictures tell the story. She's the music act on 'SNL' this weekend, and even the promo's screaming BABY ON BOARD. 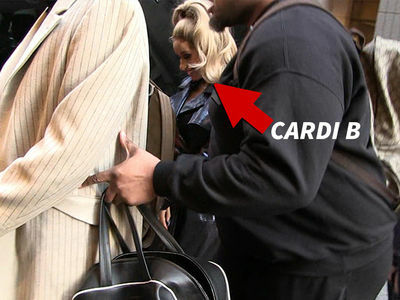 It's possible she's gonna make the announcement during 'SNL,' after all, even if the camera angles are from the waist up ... everyone in the audience will be able to see what Cardi's got going on. Not to mention, she's got Coachella next weekend, and no matter how drunk or high they are ... we're guessing someone in the crowd of more than 100k will recognize -- there's a pregnant lady onstage!! !